The adaptation of the best selling novel is about an 18 year old named Jonas who is chosen to be the keeper of memories for a town that is without feelings or emotions or memories of any kind of past. The trouble he encounters when he learns the horrific truth is what leaves the boy with the task of trying to change the establishment for the better. The Giver is visually a post George Orwell apocalyptic dream. It has some beautiful cinematography that is enough to keep the viewer interested until the lackluster final scene. Unfortunately, this movie doesn’t have much more on the positive side of translation from the novel. The performances are good in the adult form from Jeff Bridges and Meryl Streep. It’s great to see Streep in particular cast in such a role that is opposite of anything she has portrayed in the last decade. She makes you despise her just enough, but makes you understand her reasoning of the way things are the way they are. The young adult performances were as boring as the black and white scenes that happened in the film. Brenton Thwaites is on a fast track to being forgotten with bad performances this year in The Giver and The Signal. He just doesn’t come across as smart enough or threatening enough to play Jonas with any belief that this kid could take down authority. His best friend and love interest (Odeya Rush) isn’t much better as Fiona. She plays the character so well in the world of lacking emotions, but it’s done a little too well because it keeps her in sleep mode when her character is asked to visually get the horrors of this world across her blank stare. The main characters are so boring and it does no favors to a script that already has problems communicating the story it is trying to translate. At 87 minutes long, i feel like The Giver was just too short to fully explain everything that worked with The Giver’s novel. It’s in that rushed presentation that leaves the movie with a lot of unanswered questions. The ending alone will leave you feeling like you were prepared for a steak dinner and left with appetizer bread. It’s unsatisfying because it solves none of the problems occuring in the bleak world. Besides the ending, there are lots of questions that i had for the film that were not explained. Keep in mind that if you know the answers from the book, i am not reviewing the book. My review is strictly for the film, and the film did an awful job explaining things. My first question is why the townspeople worry so much about a word like “Love” when they don’t know what that word means to begin with? Katie Holmes is one of the higher ups in the film, and when her daughter learns that word she starts freaking out. What does it really matter if Katie Holmes herself doesn’t know the meaning of the word. Love is an emotion, but these people wouldn’t know that anyway because their minds are whiped clean from anything emotional. My second question (and much more important) is why would they keep someone like Jeff Bridges around anyway? 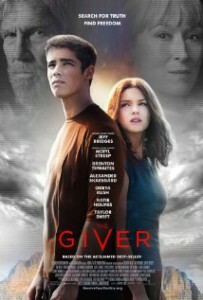 Bridges is The Giver who is being replaced by Jonas to carry all of the memories of the former world. Why is this needed at all? If i were Meryl Streep, i would want Bridges killed immediatly so word doesn’t get out of how things used to be. Keeping him alive is only causing stress for the way you currently run things. I did mention that the cinematography was one of the only things i liked about this film, and the camera work in particular gives me enough interest to see what Director Phillip Noyce could do with an independent film. The colorless shots in particular are done so creatively that it really impressed me with how smart it came across. Jonas is the narrator of the film, so everything is coming from his point of view. He is the only character who can see color, so when he is in a scene it’s full of color. Yet when he is out of the shot, the scenes quickly resort back to black and white. I really enjoyed this and it made sense creatively when trying to tell a story about characters who have literally been robbed of everything. I haven’t read the book since 3rd grade, but i remember the novel being a lot more action packed than this, and it just feels like another thing they skimped out on. The Giver isn’t a terrible movie. With the right run time and communication, a remake of this film ten years down the line could succeed. It’s a visual dream, but a translation nightmare filled with carbon performances. Wait till DVD. I just watched this for the first time. One of the blatant things that caught me is that everyone had different colors in clothing in the color scenes. If they couldn’t see color, how did they make anything with color? I did enjoy it. I don’t feel as though I just wasted an hour and a half. Was ok for a stupid, snowy last day of March.